Life comes spectacularly crashing down for high-flying City trader Dean Harrison when a deal worth millions goes disastrously wrong. 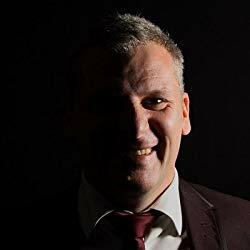 Having lost his job and on the verge of suicide, he follows advice from an elderly stranger and books into Room 119 at Welnetham Hall Hotel for what he thinks will be much-needed recuperation and self-reflection. It soon becomes apparent something strange is happening to Dean. When he checks-in to the hotel, everyone knows his name. Even more disturbing, he discovers he's travelled on a disused train line to get there. Then he notices a shadowy dark figure following him. . .
Room 119 was an immensely enjoyable and competently written debut novel by author T.F. Lince. To be perfectly honest I was half expecting a second-rate plot with underdeveloped characters but what I got was the exact opposite. It was a really good read and one I highly recommend. The story was imaginative, original and extremely entertaining. After just a few chapters I began to care deeply for Dean Harrison and where his life was heading. I realised I was becoming invested in this book and the journey it was taking me on. With an eclectic mix of characters (yes, even a clown! ), I was kept busy trying to figure out how all the pieces fitted together. I would never have guessed in a million years - it was really clever! I went into this book with reservations but came out converted. It was jolly good. My thanks to author T.F. Lince for providing me with a copy of this book. Trev Lince originates from Marske-by-the-Sea on the North East coast of England, but now lives in Darlington with his wife, Claire. Their daughter, Annie, is a very good guitarist and is setting up a band, playing every pub in the North East that she can. She’s so rock and roll, living the dream while her father is approaching his mid-life crisis. A keen golfer and frustrated Middlesbrough FC fan, Trev gets to as many matches as work and leisure time allow. He writes in what little spare time he has, when not working as a IT Consultant for a major oil company in Surrey. 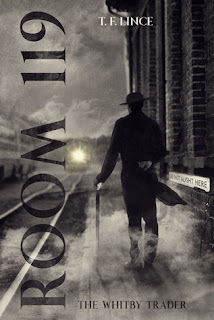 Room 119 – The Whitby Trader is Trev’s first book and he really enjoyed the experience of writing it. Who knows? He may have a few more stories bursting to get out of his head.